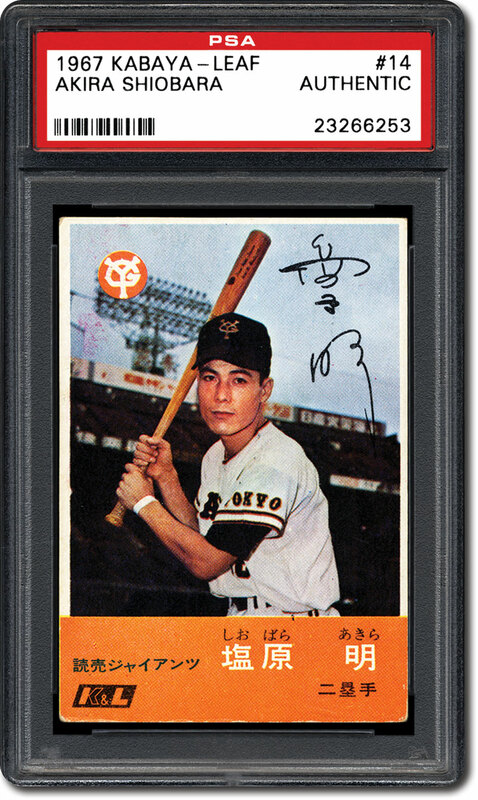 When Japanese baseball legend Sadaharu Oh signs autographs, he sometimes adds the word doryoku. So you'd have to think that Oh would be impressed by the "effort" that vintage Japanese baseball card enthusiasts devote to their collections. 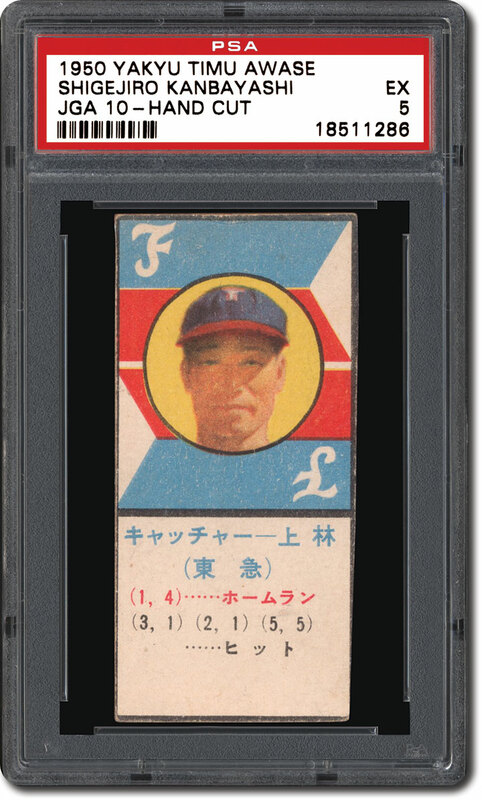 PSA consultant Gary Engel, who became the first full-time U.S. dealer of Japanese cards in 1994 and is the author of the Japanese Baseball Card Checklist and Price Guide, says the majority of vintage Japanese cards are very difficult to track down. "People talk about the [T206] Wagner card and how many of those are around, but probably 75% of the stuff in the [vintage Japanese baseball card] guide is scarcer than a Wagner card," comments Engel. "And I don't mean just in the United States. If you take every known example in the United States and Japan, there aren't that many cards that there are even 100 of." 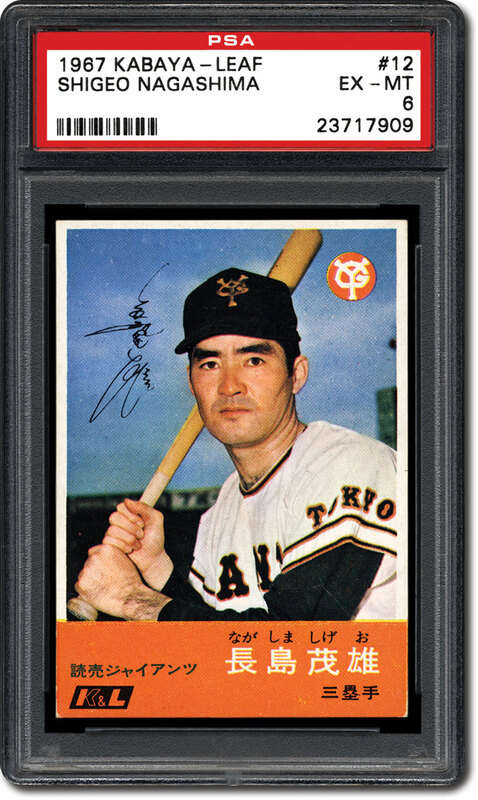 Robert Klevens, a longtime collector and owner of Prestige Collectibles, which specializes in Japanese cards and memorabilia, offers a similar assessment. "The vintage Japanese cards are just so rare compared to the American cards," he said. 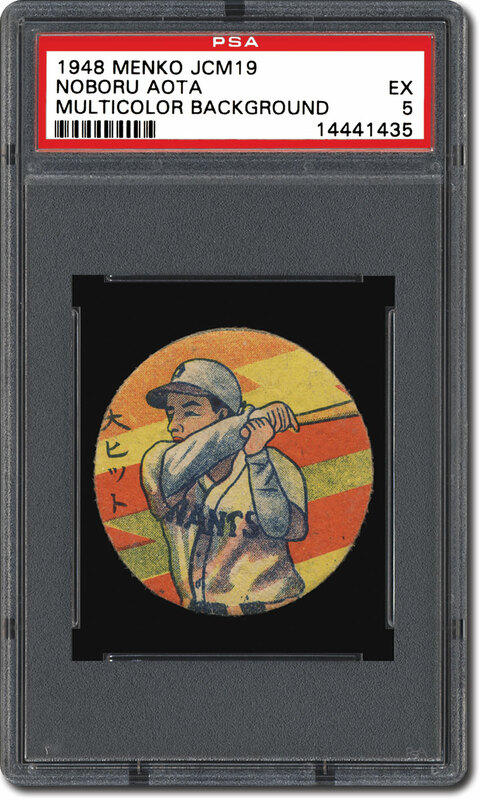 Japanese baseball author, Rob Fitts, who has three dozen Japanese card sets on the PSA Set Registry, says the thrill of the hunt is what motivates him to pursue these cards. 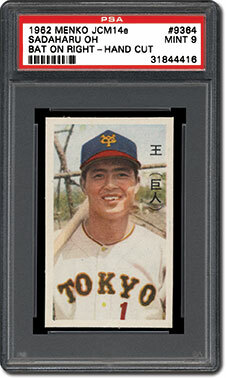 "The beauty of collecting vintage Japanese cards is you just can't go out and buy them," he said. 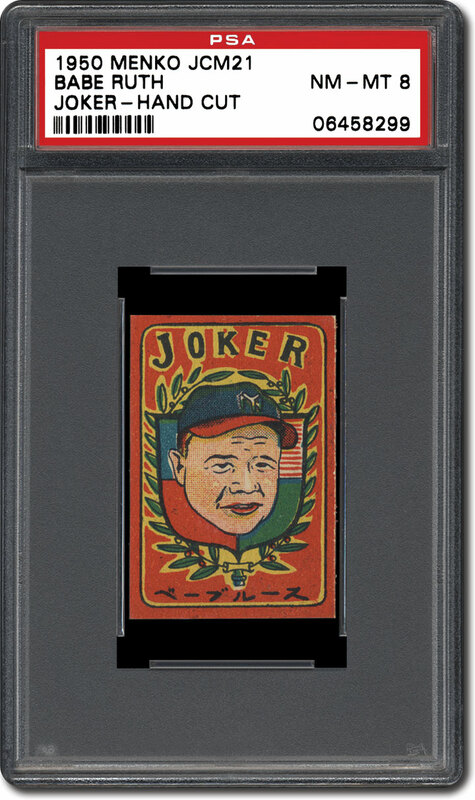 "One of the things that's always bothered me about collecting American cards is if you have the money, you can buy the card, with a few exceptions. With Japanese cards, you can't do that. You can look for cards for years and not find them for any amount of money." And it was even harder to find these cards before Engel published the first edition of his guide in 1993. 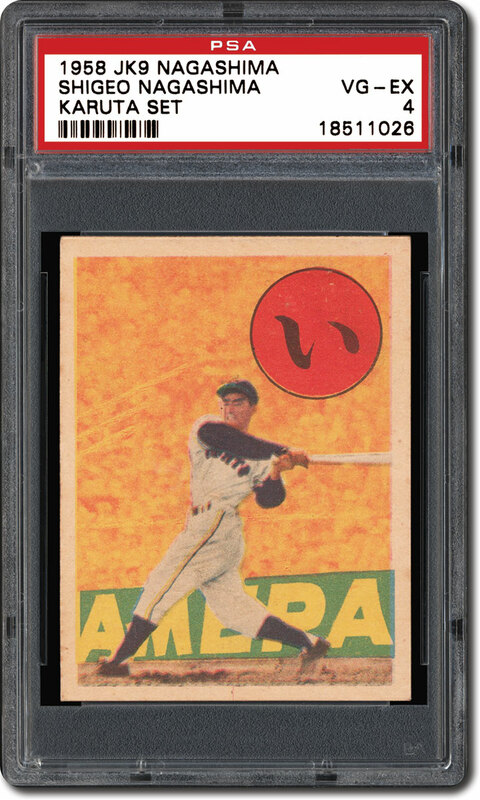 Compiling this resource was a daunting task given that many cards didn't have years, brands, or player names on them, and the older manufacturers rarely released checklists. "One big factor to point out about vintage Japanese cards is that there are way more undiscovered than there are of American cards at this point because the Japanese didn't have an organized hobby [until relatively recently]," said Engel. "There was no Jefferson Burdick or somebody like that who was cataloging stuff before the war." 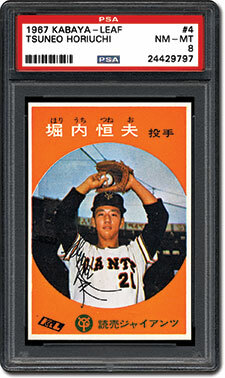 When he lived in Tokyo in 1993 and 1994, Fitts would scour flea markets and antique shops for old cards. 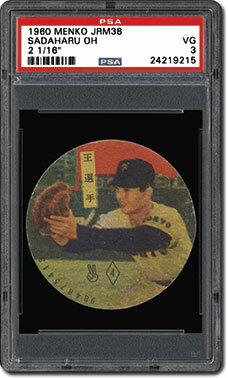 "The hobby back in the 1990s in Japan was a lot like collecting in the 1960s and early-1970s in the States," said Fitts. "You just went to flea markets and hoped that you found something, and whatever you found you bought because it may be three weeks before you found another baseball card." Reports indicate that baseball was introduced in Japan by American teacher Horace Wilson at Kaisei Gakko (which later became the Tokyo Imperial University) in 1872. The country's first baseball team was formed by the Shimbashi Athletic Club six years later. By the late 19th century, the sport was being played at high schools and colleges throughout the country. 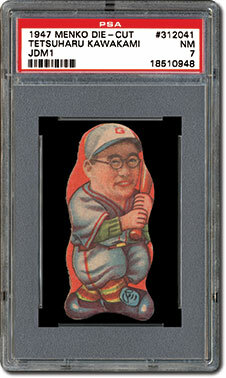 Fitts believes that the first Japanese baseball card was produced in 1897. It was a round menko that showcased a hand-drawn picture of a player with his hands over his head to catch a ball. Menko are similar to North American pogs and were used in a popular Japanese flipping game. The 1897 menko measures 1-1/2" in diameter and was part of a larger set. Klevens owns an example of this menko. By the turn of the 20th century, baseball was being played extensively at the high school and college levels, and black-and-white or sepia postcards highlighting players on the more prominent teams began to emerge. 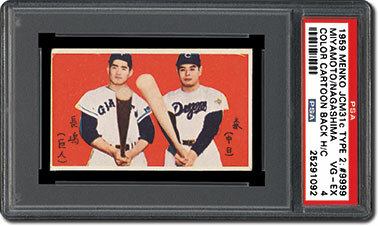 Often sold as team sets, the postcards generally didn't shine the spotlight on specific players but rather presented action shots or team images. Fitts notes that postcards were also manufactured of some American collegiate and pro teams that toured Japan between 1905 and 1929. Klevens, who owns more than 2,000 vintage postcards, says the postcards of the touring U.S. teams are some of the most coveted. 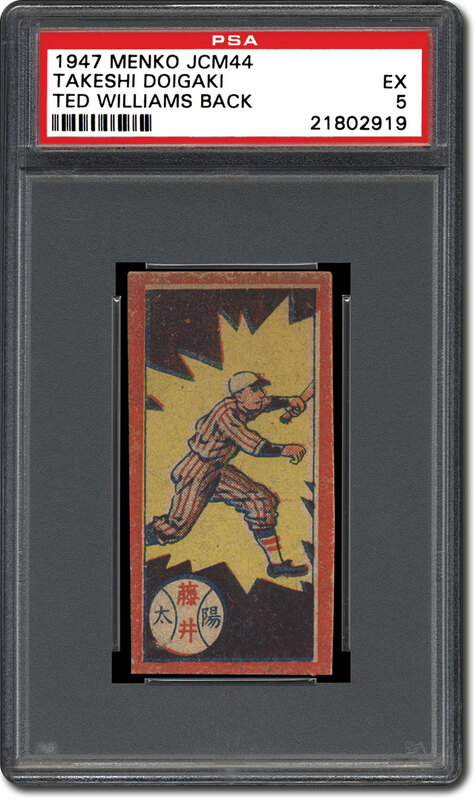 An ungraded 1920 U.S. All-Star Japan Tour postcard of Eddie Ainsmith, for example, fetched $358 in a Prestige Collectibles auction in March 2017. Postcards were the most prevalent form of Japanese cards until menko were more widely produced in the 1920s and 1930s. The menko from this era are generally smaller than U.S. baseball cards, but they are printed on thicker cardboard stock. Most have artwork of a player on the front, rather than a photo. Fitts indicates that they can be uncovered in four different shapes: round, rectangular, oblong (or bookmark), and die-cut. "In the early 1920s, you see a lot of menko of generic players, or they have the name of the university on them but no player name," noted Engel. Engel adds that almost all of the pre-war menko were produced between 1929 and 1934, but that the true menko boom didn't happen until the late 1940s. "The thing about menko is that it's really hard to get them in high-grade condition because they were actually toys. 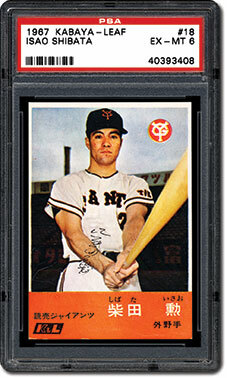 They were flipping cards, so most of the cards out there are going to be VG or less," said Fitts. Menko were sometimes marketed in small envelopes that were strung together called taba, which translates to bunch or bundle. 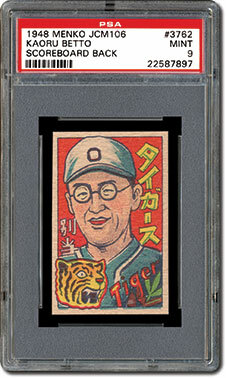 They were also often sold in uncut sheets that were hand cut by collectors. Prices for vintage menko can range from $10 for a generic common player to over $1,000 for high-grade menko of visiting major league superstars. 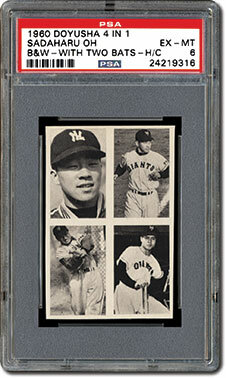 Starting in the late 1920s, black-and-white or sepia photos called bromides were available on a larger scale. These rectangular-shaped pictures are generally blank-backed and highlight collegiate standouts or visiting major leaguers. They can vary significantly in size, all the way from 1-1/2" by 2-1/2" to 8" by 10". "Some people like the bromides because they're actual photographs of the players," said Klevens. Engel points out that bromides were more widely produced after World War II. 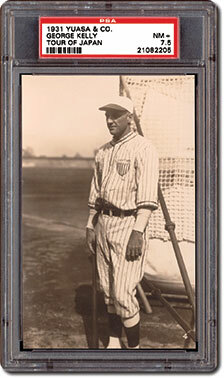 Many of these feature professional players and they were frequently glued into albums. 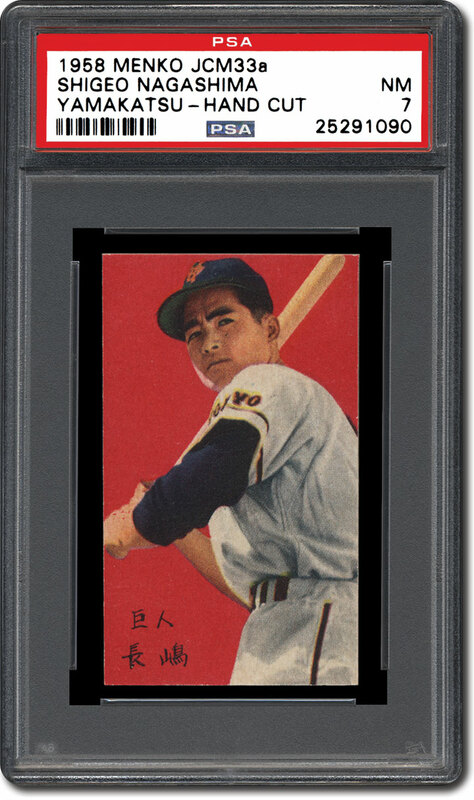 By the early 1950s, however, bromides had all but disappeared. 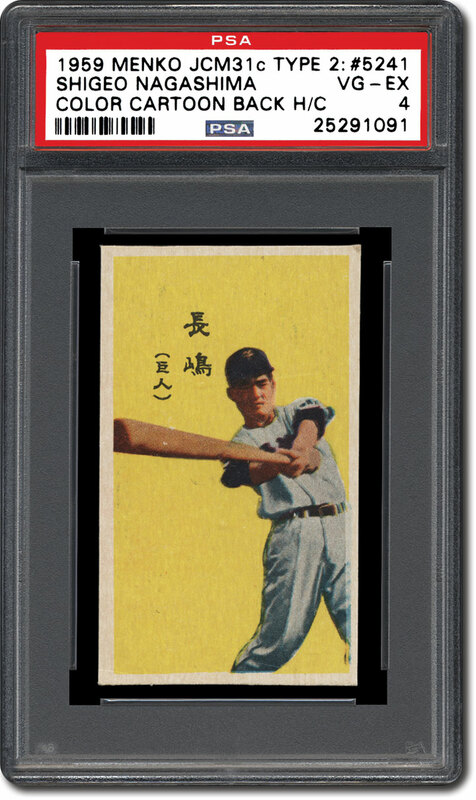 Prices of bromides can range from $10 for a common Japanese player to $5,000-plus for a high-grade Babe Ruth bromide from the U.S. Major League tour of Japan in 1934. 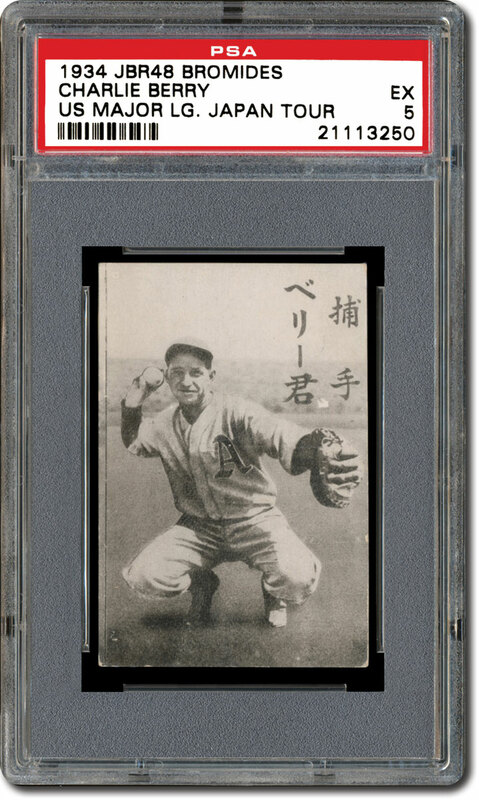 Major league players had toured Japan before, but never with as much fanfare as the 1934 American All-Star team that featured Babe Ruth and Lou Gehrig. The U.S. squad, which also included legends like Jimmie Foxx and Charlie Gehringer, played 18 exhibition games against a collection of the best amateur players in Japan. Attracting huge crowds wherever he went, the "Great Bambino" didn't disappoint on the field, belting 14 home runs during the tour. The Americans won all 18 games by a combined score of 181-36. 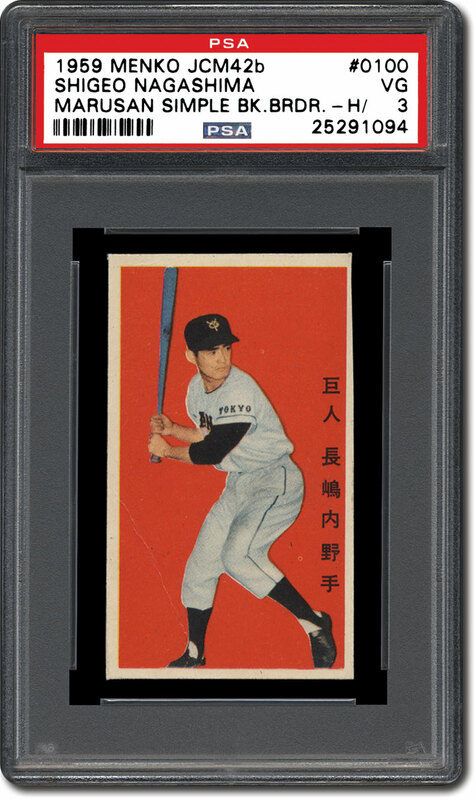 This tour ignited a passion for professional baseball in Japan and helped inspire the creation of a league in 1936 that would later become known as Nippon Professional Baseball (NPB). 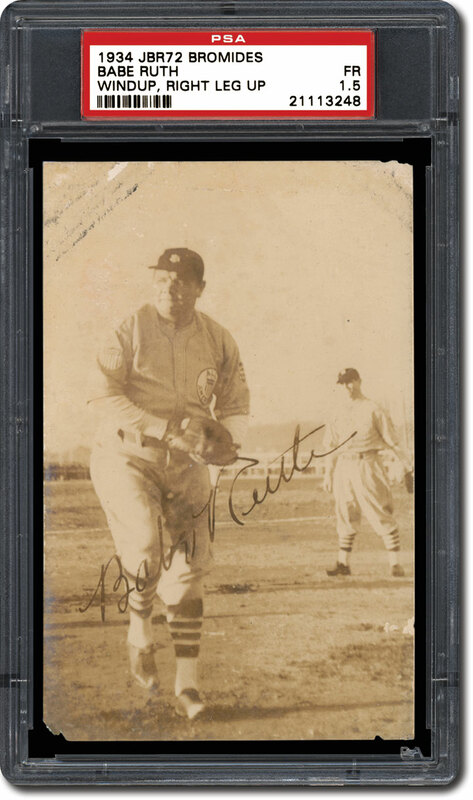 Fitts, who has written an award-winning book called, Banzai Babe Ruth: Baseball, Espionage and Assassination During the 1934 Tour of Japan, indicates that there are three key bromide sets devoted to the 1934 tour: 1934 U.S. Major League Tour of Japan (JBR 48) (20 cards), 1934 All-Maruzen U.S. 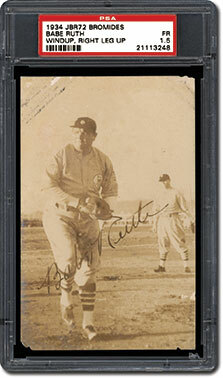 Baseball Team (JBR 34) (16 cards), and 1934 Babe Ruth Large Bromides (JBR 72) (eight cards featuring Ruth). Only a few examples from each of these series have surfaced. The Ruth bromides from these series are likely to sell in the $5,000 to $10,000 range in top form. According to Engel, game cards were most prominent from 1948 to 1955. Approximately the same size as menko and smaller bromides, most of the game cards showcase black-and-white photos and were issued in a variety of ways, including boxed sets, uncut sheets, or in youth baseball publications. One of the most coveted series came from a card-matching game called karuta. The karuta cards were distributed in boxed sets, and Fitts points out that these were made of sturdy cardboard and are some of the most attractive cards of the era. 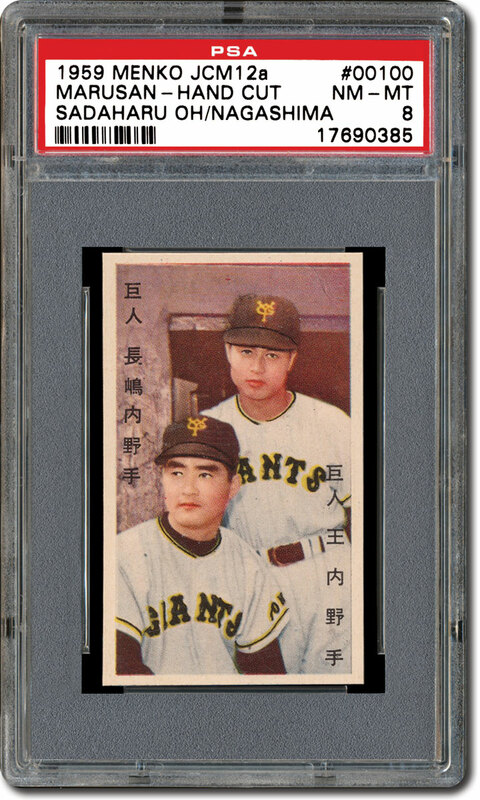 Prices can range from a few dollars for a common game card to around $500 for the Ruth card featured in the 1949 Tohoku Karuta Set (JK 5) in high grade. Tobacco menko were unveiled in the late 1950s. 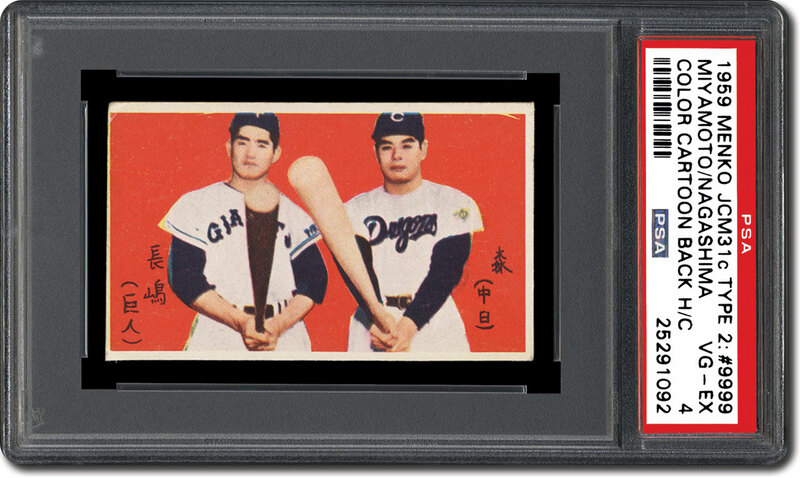 Despite their name, these rectangular, 1-13/16" by 3" cards were not sold with tobacco. They're referred to as tobacco menko due to their similarities to early 20th century U.S. tobacco cards. 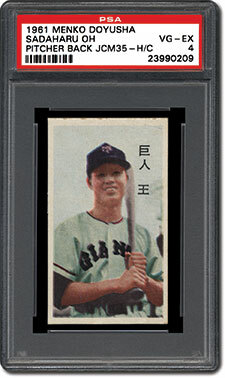 Hundreds of these sets featuring NPB players were produced. 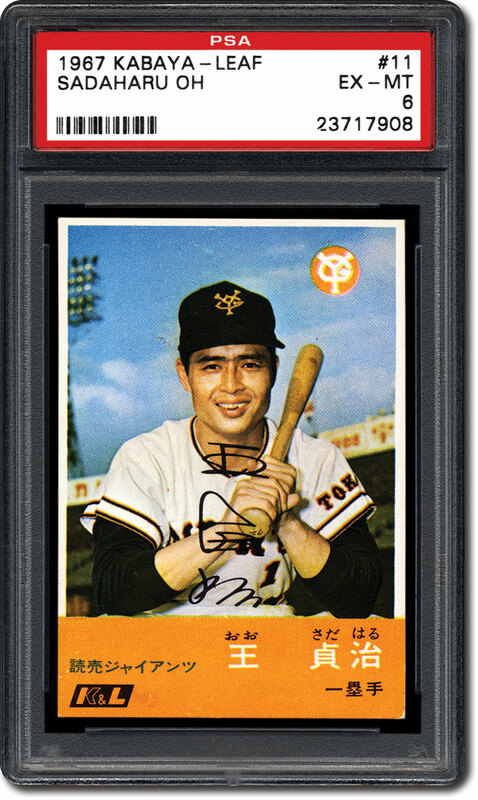 The rookie cards of two of the most legendary Japanese players - Shigeo Nagashima and Sadaharu Oh - can be found in tobacco menko sets. "The reason that tobacco cards got going in 1957 and 1958 is because of Shigeo Nagashima, who is the most popular player in Japanese history," noted Engel. The veteran hobbyist explains that prior to becoming a professional superstar with the Yomiuri Giants, Nagashima was a celebrated collegiate star. Oh made his cardboard debut in 1959 tobacco menko sets. "There are probably 50 to 100 Sadaharu Oh rookies," explained Engel. 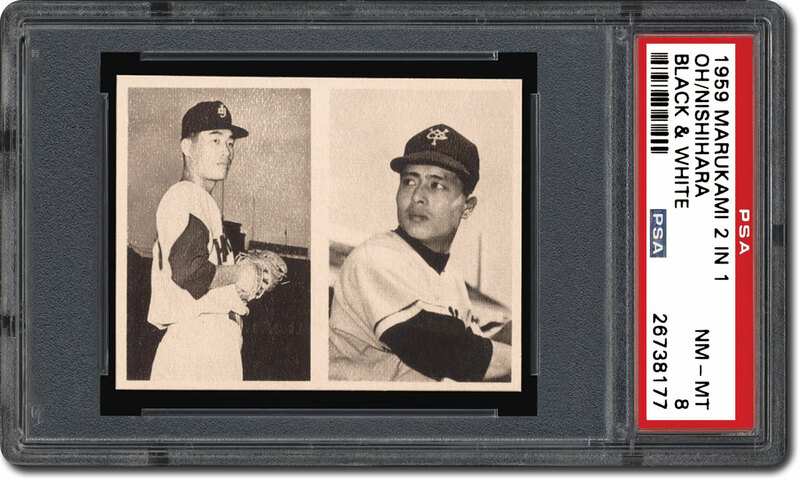 "It's not like a Mantle rookie where there are only a couple. 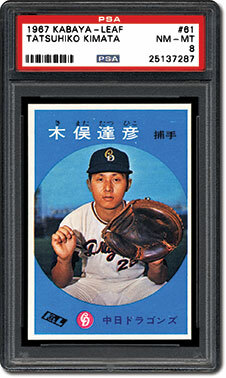 All of the 1959 rookies are probably the most sought-after cards among American collectors of vintage Japanese cards. 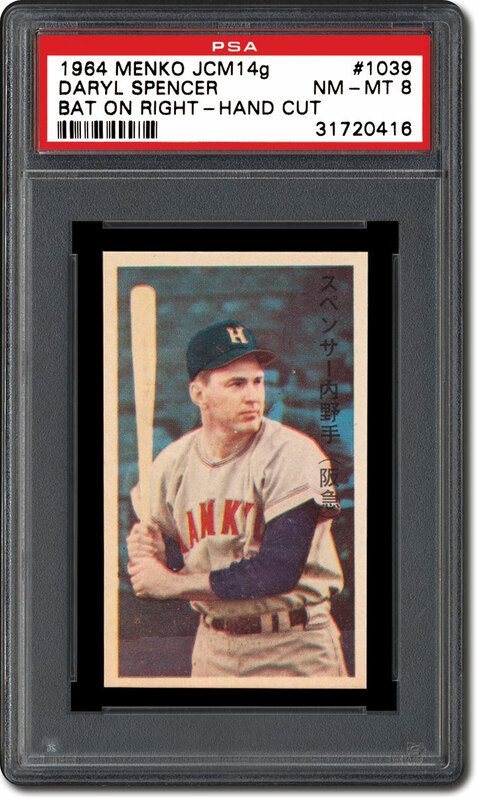 Some of the Oh rookies are worth more than others because they're scarcer, but there's not just one [standout] rookie like the 1952 Topps Mantle." One PSA MINT 9 (OC) Oh rookie from the 1959 Hoshi Gangu tobacco menko series was being offered for $7,999 on eBay in October 2017. This is the highest PSA-graded example of this card. 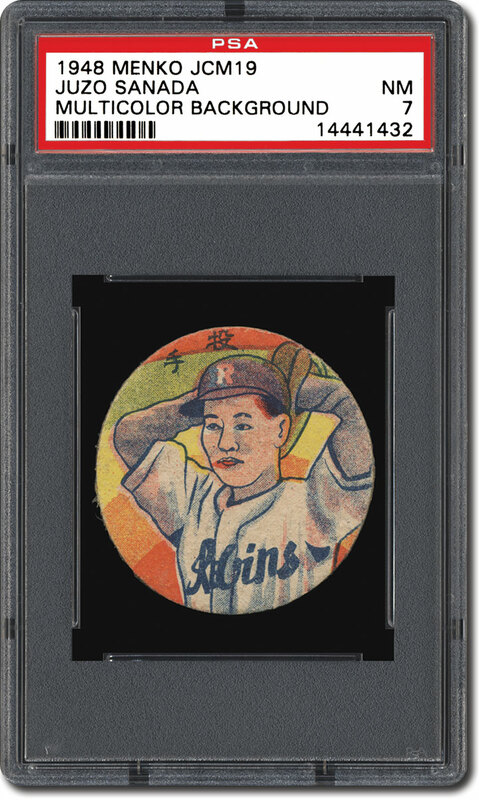 With that said, Fitts points out that there are some non-graded Oh rookies that can be purchased for under $100 in lower grade. 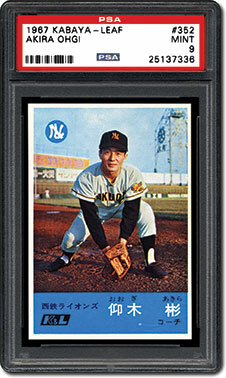 The heyday for vintage candy and gum NPB cards was the 1950s and 1960s. These are generally scarcer than menko and bromides and were often printed on light paper, which makes them almost impossible to find in top condition. Fitts notes that many of these were available at small candy shops and were sold with a piece of wrapped candy. "In 1960, it seems like every single company that made gum or caramel in Japan decided to make baseball sets. I don't know why, and we're still discovering new sets," said Engel. Sets Imported into the U.S. According to Engel, a significant quantity of cards from three NPB Japanese sets - 1964 Morinaga Stand-Ups, 1965 Fujiya Gum, and 1967 Kabaya-Leaf - were imported into the United States in the late 1960s and many of these were later sold. 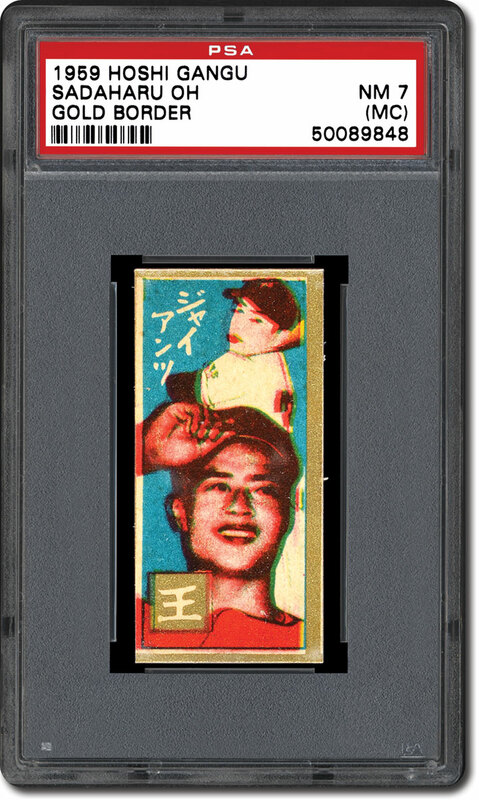 With a design resembling that of the 1964 Topps Stand-Ups series, the white-bordered, 1964 Morinaga cards measure 3-1/2" by 5-1/2" each and flaunt color photos on the front and player data on the backs. Seventeen cards have been identified, but only 12 were reportedly imported into the U.S. in the late 1960s. 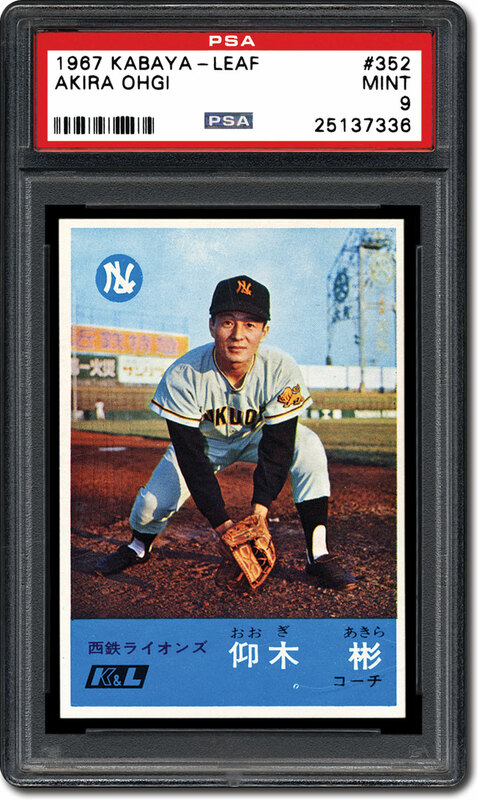 The 105-card, 1967 Kabaya-Leaf series is the most collected Japanese NPB vintage set in the U.S.
"It's like a T206 or 1952 Topps for American Japanese collectors, but not for Japanese collectors," explained Engel. "The reason for that is they're rarely ever seen in Japan. There are more Kabaya-Leaf cards in the United States than there are in Japan right now by a factor of 10." Measuring 2-3/8" by 3-3/8" each, these are the first Japanese cards to resemble American cards. Two different front designs are employed in the set, one that showcases the player's photo in a circle (similar to the 1959 Topps cards), and a second with a large photo taking up the bulk of the front with the player name in a colored rectangle at the bottom (similar to the 1963 Topps cards). The horizontal backs offer stats and text in Japanese. 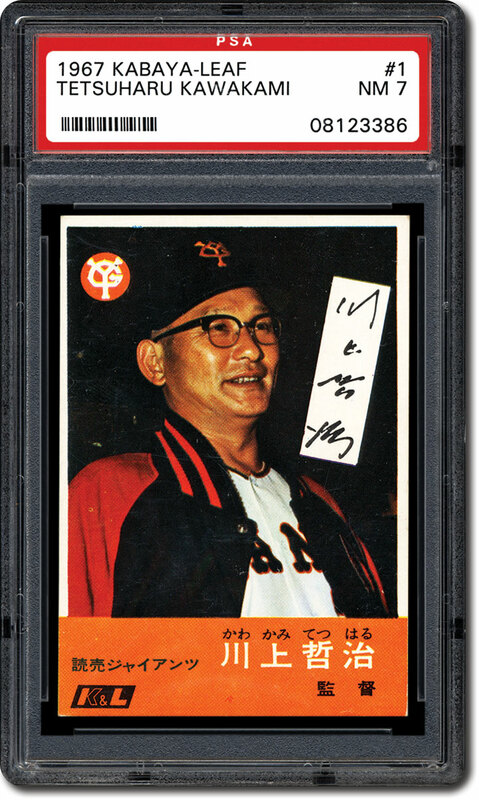 It should be noted that there are four Yomiuri Giants cards within this series that are extremely rare: Hideki Watanabe (#2), Kunio Jonouchi (#3), Kazumi Takahashi (#8), and Katsutoyo Yoshida (#17). For some reason, very few examples were imported into the United States in the late 1960s. Although he cannot specify a precise number, Engel believes that of those four cards, "there are fewer than 10, maybe even five, of each of those cards." 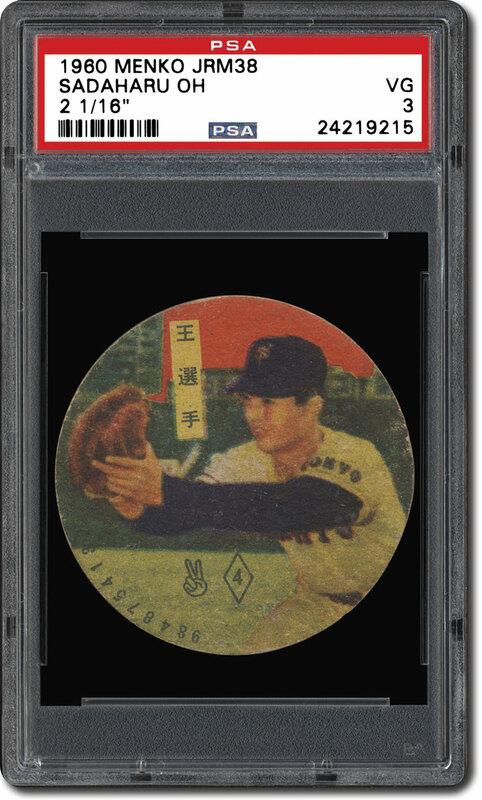 An ungraded VG-EX example of the Jonouchi sold for $2,295 in a Prestige Collectibles auction in October 2017. 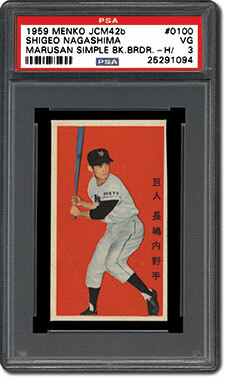 A VG-EX Takashi garnered $1,725 in the same auction. 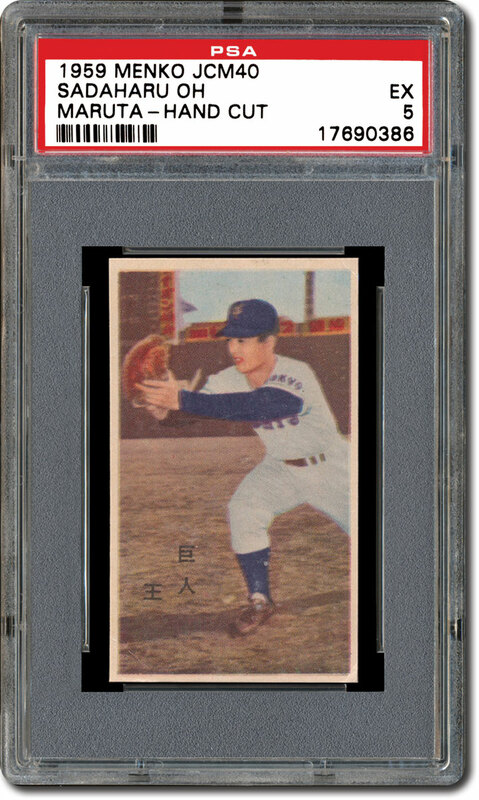 Engel, Fitts, and Klevens agree that uncovering a vintage menko or bromide of Eiji Sawamura would be the ultimate Japanese baseball card. Sawamura became a Japanese hero on November 20, 1934, when as a teenager pitching against the powerhouse American All-Stars squad, he, at one point, fanned Gehringer, Ruth, Gehrig, and Foxx in succession and allowed only one run in the entire contest. He later evolved into his country's best pro pitcher. 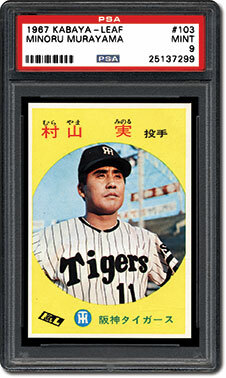 Sadly, Sawamura was killed during combat in World War II. 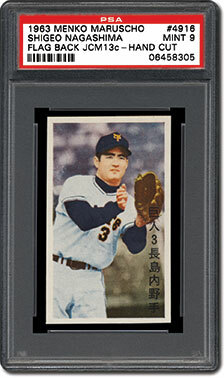 Today, NPB's equivalent of the Cy Young Award bears his name. "There are no known vintage cards of him from his playing days. If one shows up, that would be the Holy Grail of Japanese cards," said Fitts. "And if it does, it will probably be a bromide." Despite their rarity, most vintage Japanese cards are still relatively affordable and not widely collected in the U.S.
"I think the biggest [obstacle] is that American collectors can't read them and they're not that familiar with the players," said Klevens. Also, in general, the Japanese have not warmed to collecting vintage baseball cards, but Engel, Fitts, and Klevens have noticed a small growth in interest. 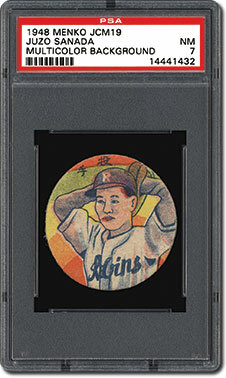 "I'm guessing that more Japanese people are looking at vintage cards than they used to, but we're still talking about very small numbers," said Fitts. "We're not talking about hundreds of thousands of individuals. We're talking about dozens or a couple hundred collectors in Japan who are serious vintage collectors." 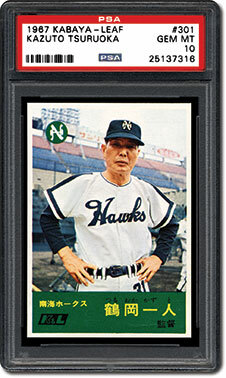 So for the most part, vintage Japanese cards still represent a largely untapped market. 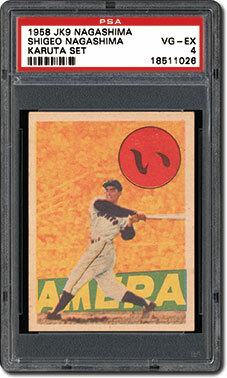 "American vintage cards can be so expensive and you don't really see anything new," said Klevens. "But [collecting vintage Japanese cards] is different because you can learn about it and it's a lot more affordable compared to the American cards." 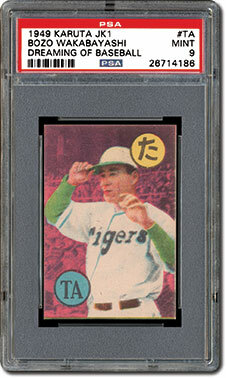 Fitts is similarly enthusiastic about vintage Japanese cards. "I really think that Japanese cards are open for investment," he said. "But you have to be smart. You have to do your research. There are a lot of undervalued rookie cards. Even Oh rookies are underappreciated in America." Click here to read Part 2 of this article. 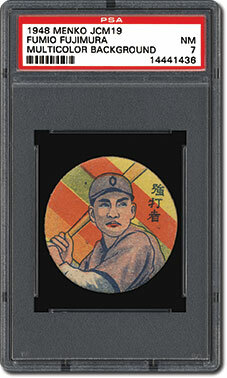 For more information on vintage Japanese baseball trading cards, please visit https://www.psacard.com/cardfacts/#13baseball-cards. Please feel free to contact Kevin Glew at [email protected] if you have any additional information or comments. Thank you to Rob Fitts, Mark Holt, Nate Leech, and Robert Edward Auctions for providing cards and images for this article.